Timelapse animation of the western half of Las Vegas, Nevada, from 1972-2013, as captured by Landsat sensors. The images are in false-color, showing healthy vegetation in red. 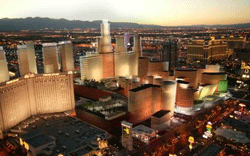 In early March it was announced that Malaysian conglomerate, Genting Group, has purchased the Echelon site on the Las Vegas Strip and plans to build a $2 Billion hotel-casino complex, named Resorts World Las Vegas. "The Genting Group and Resorts World Las Vegas will bring several thousand new jobs to our state and will help us in keeping our economic resurgence on the right path toward success," said Nevada Governor Brian Sandoval. CityCenter is an enormous mixed use, urban complex that opened in December, 2009 in the heart of the Las Vegas Strip. 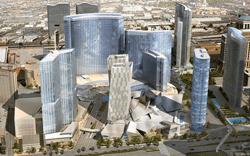 It is a 16,767,000 square foot development on 76 acres that includes a 4,000-room hotel and casino (Aria), two 400-room boutique hotels (The Residences at Mandarin Oriental, with 227 residential condo units, and the Harmon Hotel and Spa), a residential tower, a condo-hotel and a 500,000 sq ft retail and entertainment district. The project cost $11 billion and is currently the largest privately funded construction project in the history of the United States. It took three years to construct the CityCenter and it has drawn an enormous amount of attention for its environmentally sustainable construction and unique architecture.